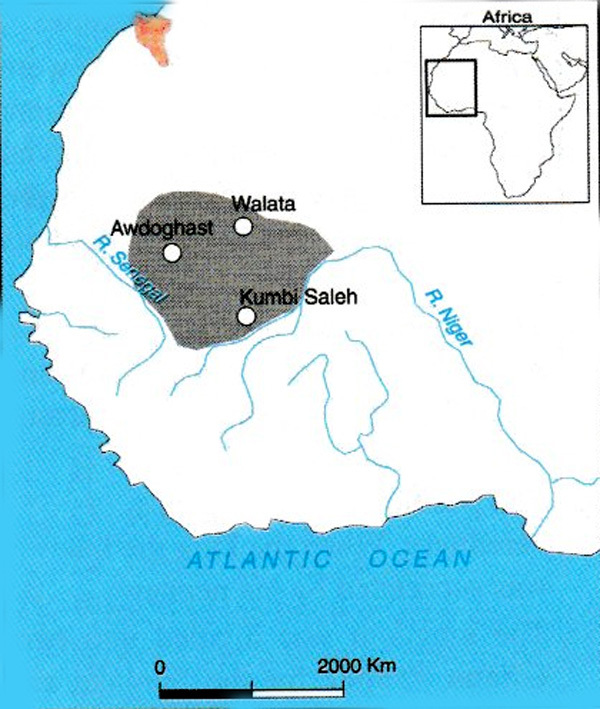 - This kingdom was founded by the Soninke people and is sometimes referred to as Ancient Ghana. - It occupied the savanna region extending from the edges of the tropical rain forest in the South to the edge of the Sahara Desert in the North. - It was located between River Senegal, flowing westward into the Atlantic Ocean, to River Niger before it joins its tributary (Benue) to flow southward. 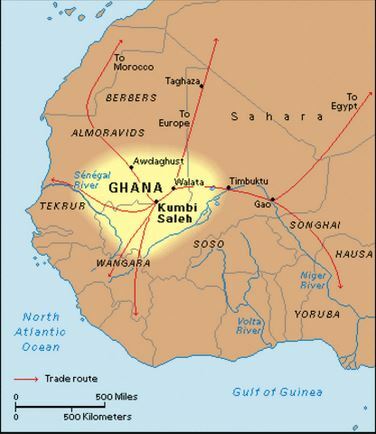 Old Ghana engaged in barter trade with Mediterranean countries. The main products from the Kingdom were ivory, gold, kola nuts, and honey. In return, the people of Old Ghana received clothes, copper, salt, beads, swords, knives, arrowheads and nails. In some cases, it was silent trade. The Walata people that mined gold were afraid of sending it to the market. They then would leave it on the banks of River Senegal and hide in the bushes. The traders would then come and take the gold and in its place, leave salt, clothes and other goods. The traders did not see each other face to face for negotiations. The kingdom controlled the Trans-Saharan Trade routes in the region which mainly involved Arabs and West African communities. It had a king as the ruler. The king was the religious leader who was also worshipped by the people. When the king died he was succeeded by the sister’s son. The people in the kingdom were mainly engaged in trading, cultivation, livestock keeping and mining alluvial gold. This gave it economic power. It also had enough food to feed its people. The kingdom had a strong army. As a result, it conquered its neighbours and expanded the kingdom which became very powerful. The position of the king was hereditary. When the king died, he was succeeded by his nephew. The kingdom was divided into two, Ghana Proper for the Soninke and provisional Ghana or conquered land. He made important decisions regarding the kingdom. He ensured that the people in the Kingdom were united. He acted as the chief judge and settled disputes. His word was final. He was the Commander in chief of the army. He controlled the Trans-Saharan Trade. To convert all Negroes in this region to Islam. To recover the control of the southern section of the Trans-Saharan Trade route. This route was the main source of livelihood for the people of Old Ghana. There were also frequent internal conflicts within the Old Ghana Empire, which had significantly weakened it. It was therefore not easy for it to resist external attacks. Many people were killed by the invaders from the north, and those that survived were forced to convert to Islam. In 1076, the kingdom finally fell. They unified the community under one leader. They defended the freedom of the community. They gave members of the society a sense of belonging. They settled disputes among members of the society. They officiated and conducted ceremonies. Their laws, customs and taboos brought order in the society. They preserved the community's cultures. They trained and shaped future leaders in the community.